The Affordable Care Act prohibits some of the worst insurance industry practices that have kept affordable health coverage out of reach for millions of Americans. It provides families and individuals with new protections against discriminatory rates due to pre-existing conditions, holds insurance companies accountable for how they spend your premium dollars, and prevents insurance companies from raising your insurance premium rates without accountability or transparency. For more than a decade before the Affordable Care Act health insurance premiums had risen rapidly, straining the pocketbooks of American families and businesses. Oftentimes, insurance companies were able to raise rates without explanation to consumers or public justification of their actions. The Affordable Care Act brought an unprecedented level of scrutiny and transparency to health insurance rate increases by requiring insurance companies in every state to publicly justify their actions if they want to raise rates by 10% or more. Insurance companies are required to provide easy to understand information to their customers about their reasons for significant rate increases, and any unreasonable rate increases are posted online. A new report released today shows that the health care law is helping to moderate premium hikes. 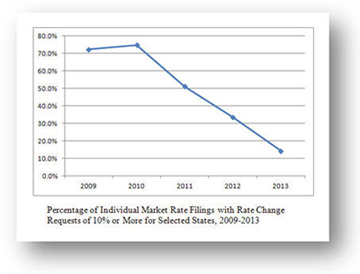 Since this rule was implemented, the number of requests for insurance premium increases of 10% or more has dropped dramatically, from 75% to 14%. The average premium increase for all rates in 2012 was 30% below what it was in 2010. And available data suggest that this slowdown in rate increases has continued into 2013. Moreover, when an insurer does decide to increase rates, consumers are seeing lower rate increases than what the insurers initially requested. In the review of rate requests for 10% or more, over 50% resulted in customers receiving either a lower rate increase than requested or no increase at all. States have received $250 million in Health Insurance Rate Review Grants to help strengthen and improve their rate review processes thanks to the Affordable Care Act. Of the 44 states that received rate review grants, 40 have reported enhancements to their rate review websites. These website enhancements include searchable rate filings, new public comment options, live streaming of rate hearings, and plain language explanations of rate review and rate filings. The Effective Rate Review program is one of many in the health care law aimed at protecting consumers. The rate review program works in conjunction with the 80/20 rule, which requires insurance companies to generally spend 80% of premiums on health care or provide rebates to their customers. Insurance companies that did not meet the 80/20 rule have provided nearly 13 million Americans with more than $1.1 billion in rebates. Americans receiving the rebate will benefit from an average rebate of $151 per household. Additionally, today we issued a final rule that implements five key consumer protections from the Affordable Care Act, including protection against denial of health coverage because of a pre-existing condition. This rule makes the health insurance market work better for individuals, families and small businesses, and it also increases the transparency brought to rate increases by directing insurance companies in every state to file all of their rate increase requests.